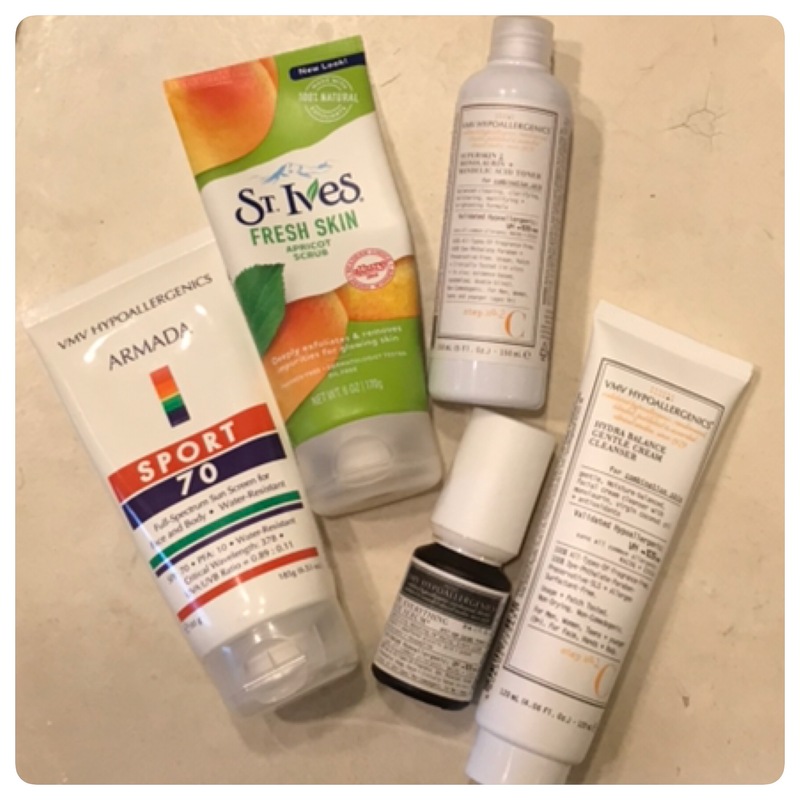 This post is related to my blog entry entitled “My Core Products For My Nightly Skin Care Routine”. This is my morning counterpart. I use these everyday, with the exception of St. Ives Apricot Scrub. Some products that I mention in this video/post are only mentioned in my other post/video entitled“My Favorite Skin Care Products“ and “Good Skin”. I uploaded a 4-part video of my daily skin care routine to my Instagram page. three one-minute segments and one forty eight-second segment. Click here to see the original Instagram video entry. It is also currently uploaded to my YouTube channel for ease of viewing. The reason why I love using the St. Ives Fresh Skin Apricot Scrub is because it is the only scrub that I have tried that agrees with me. I do not break out from this nor do I experience sensitivity. I like that the “scrub” is made of crushed walnut shells and not tiny beads that get into my pores and irritate them ~ leading to pimples. I do not use this every day. I use this primarily when I plan to shave. It helps soften my beard. I also use this after the gym or any outdoor activity (as long as I do not have sunburn). This helps me get rid or dirt and gunk from my face. I gently massage the product on my face. When I say gently, I mean REALLY GENTLY. This is a scrub, as with anything else, any thing in excess can do more harm than good. One thing I have to say though is that, facial scrubs are not for every one, especially those who have sensitive skin. So always be wary when choosing a product for your skin type. St. Ives Apricot Scrub is available at most supermarkets/beauty emporiums. I usually purchase mine in Watsons. VMV Hypoallergenics’ Hydra Balance Gentle Cream Cleanser for Combination Skin is what I regularly use. It’s a very gentle cleanser that leaves my skin fresh. The main ingredients are monolaurin, a derivative from coconut oil, and green tea that helps fight bacteria + oxidation that eaves my skin well balanced and not MATTE. VMV Hypoallergenics’ Superskin 2 Monolaurin + Mandelic Acid Toner is actually a re-forumulation. The old Superskin formula had Retinol in it and since anything with Retinol needs a doctor’s prescription. They came up with this and it’s very good. Filled with Alpha and Beta Hydroxy Acids to help renew the skin. This is what makes my skin appear “bright”. Monolaurin for it’s anti-bacterial and anti-acne properties. VMV Hypoallergenics’ Re-Everything Eye Serum is discussed on my blog entry “Good Skin”. You can read it up there. VMV Hypoallergenics’ Armada Sport 70. My Saviour, My King. I have an entire Pinterest page dedicated to this sunscreen. This is my favorite sunscreen in the whole wide world. It is effective in not making me “burn”. I do get a substantial tan with out the redness or the pain from a sun burn. I have used this sunscreen a number of times as a makeup base because it is silicone based. The film-forming capability of this sunscreen looks in all the moisture, keeping my skin hydrated all day. The other factor that I love about this product is that it does not make me look white and I do not get flash back when my photo is taken. Searching for the right skin care products, creating a routine and sticking to that routine can be quite daunting, just see it through and be patient. Results don’t happen over night. Be patient. It’s a slow and steady process with a rewarding end result. I hope you can see mine. If you are in the Philippines and are interested on the products I mentioned visit www.vmvhypoallergenics.ph and for the rest of the world www.vmvhypoallergenics.com. They deliver.